This chapter inquires into the role of social media in electoral campaigning. 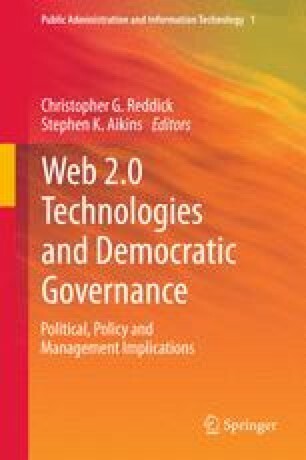 Although parties and leaders agree on its importance and are very interested in promoting their presence and activity on the Internet by using tools like Twitter, it is still unclear whether or not they have coherent strategies to adopt the principles of the so–called Web 2.0. This chapter provides empirical data about the presence and behavior of local political leaders in the digital/virtual social networks during the May 2011 local election campaign in Spain. It aims to answer five research questions: (1) Which candidates to the mayoralty employed Twitter during their campaign? (2) To what extent did they use Twitter? (3) Did they manage to widen or deepen their network during the campaign? (4) Did they really use Twitter to boost their dialogue with the electors linked to this network? (5) Did the candidates’ gender, age, political party, municipality have an effect in this behavior? To address these questions, this paper presents and analyzes a database that includes all the incumbent mayors of Spanish cities with a population over 100,000 inhabitants. This will make it clearer if Spanish local leaders used the digital/virtual social media only for placing their campaign message or whether they are developing new and more open campaigns based on Web 2.0 principles. Cocktail Analysis (2011) Informe de Resultados. Observatorio Redes Sociales. Tercera Oleada. Available on line: http://www.tcanalysis.com. Accessed: 21-X-2011. EUROSTAT (2011). Europe 2020 Indicators. Available on line: http://epp.eurostat.ec.europa.eu/portal/page/portal/statistics/themes. Accessed: 21-X-2011. Fundación Orange (2011). Informe eEspaña 2010. Fundación Orange: Madrid. Available on line: http://www.informeeespana.es/docs/eE2011.pdf. Accessed: 21-X-2011. INE (2011) Estadística de enseñanza universitaria, 30. 05.2011. Available on line: http://www.ine.es/jaxi/menu.do?type=pcaxis&path=%2Ft13%2Fp405&file=inebase&L=0. Accessed: 21-X-2011. Intelligence Compass (2010) Informe sobre Política y redes sociales. On line: http://intelligencecompass.com/images/Informe%20Pol%C3%ADticos%20y%20Redes%20Sociales.pdf (Accessed 23-XII-2010).